Obituary for Pauline (Erno) Rasch | Stone Funeral Home, Inc.
Pauline was born in Boyne City on October 16, 1922 to Louis and Thelma (Jacobson) Erno. She lived her entire life in Boyne City where she attended school a graduated with the class of 1941. On February 14, 1942, she married Frederick Rasch, also of Boyne City. Together, they raised three children in a loving Christian home. 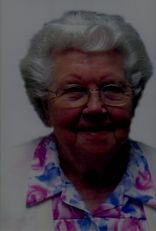 She enjoyed family gatherings, crocheting afghans, making quilts and making clothes for her children and grandchildren. In her younger years, she loved riding bike and taking walks with family and friends. Pauline was honored for being the last surviving “charter member” of the Boyne City Church of The Nazarene where she attended church faithfully and taught Sunday school for many years. Pauline is survived by two of her children: Sue (Harold) Brooks, David (Debra) Rasch, daughter-in-law Paula Rasch, sister Sally (Ray) Askins, brother-in-law Herb Howard, eight grandchildren, ten great grandchildren and six great-great grandchildren with one on the way.